It is quite rare to see Catherine, (a.k.a. 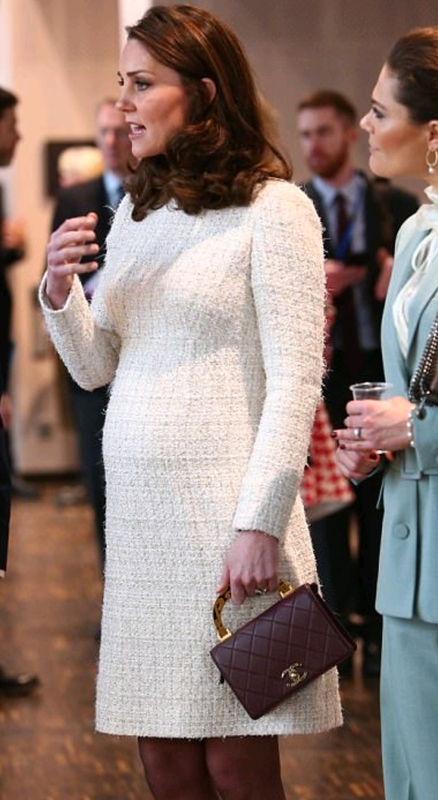 Princess William) the Duchess of Cambridge, carrying a bag with an obvious logo. Most of her bags even from before she married Prince William bordered on the sedate side, style- wise. Except with her two more easily recognized bags, Tod’s and Longchamp, there was really hardly much else noteworthy metioning. In 2017 as she and Prince William embarked on a Royal tour which included a visit to Paris, it was then that I saw her carrying a Chanel bag for the very first time. A few things came to mind then when I first saw the images come through. She wore a Chanel total look. The outfit doesn’t suit a very lovely young lady in her 30s. It would’ve been better on a more mature woman. What on earth is that bag?!?! 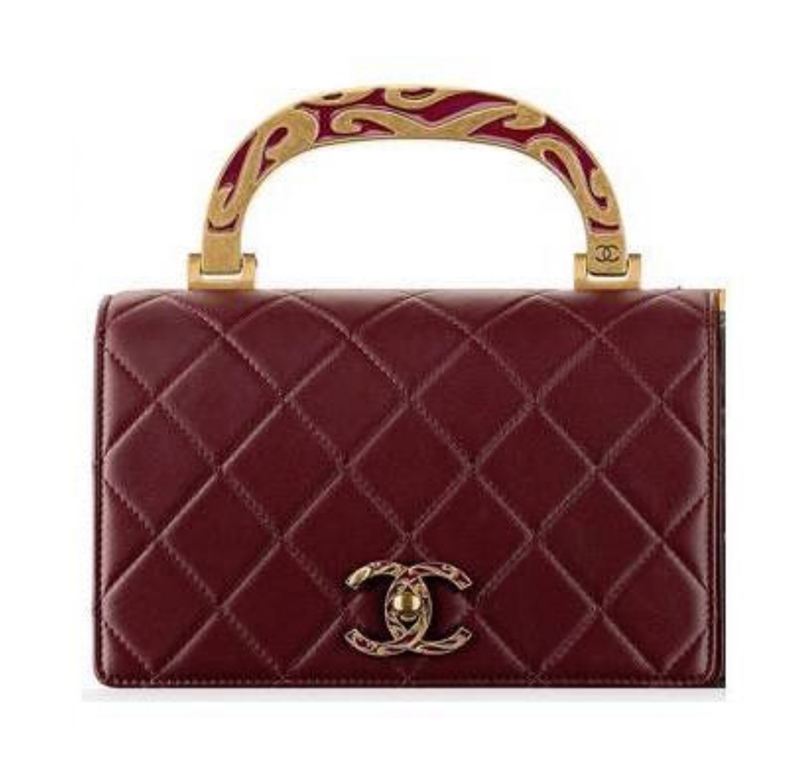 For starters, let me just state that I am not a very big fan of bordeaux/ plum/ wine- colored bags. They’re pretty up there on my no-go color buys– next to peach or mint green *cringe*. A week ago, Catherine carried the same bag again to her trip to Sweden with Prince William. Wearing a striking red houndstooth coat, that Chanel bag makes an appearance once more. It actually appeared twice on that same tour. Baby bump on display= super adorable. Bag= super ugly. Here is a closeup of the bag, said to have cost about US $4,500 back in 2015. The body of the bag itself isn’t what bothered me. It is a classic flap style. It was the handle that made me stare at it in bewilderment. 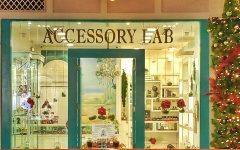 Made out of brass or some kind of metal with enamel detailing on it, the bag with the handle as a whole looked like it was more suited to be carried by an older lady. And even then, I doubt someone like the Queen of England would’ve taken to this bag. For the way it looks, it is much too overpriced. And it just does not flatter at all. I get that Catherine remains conservative in her style choices, choosing to be practical (recycling) over being a fashion plate (and wearing something new each time). She has made some bolder choices in the past and has looked stunning more often than not, but her Chanel bag just really needs to go. 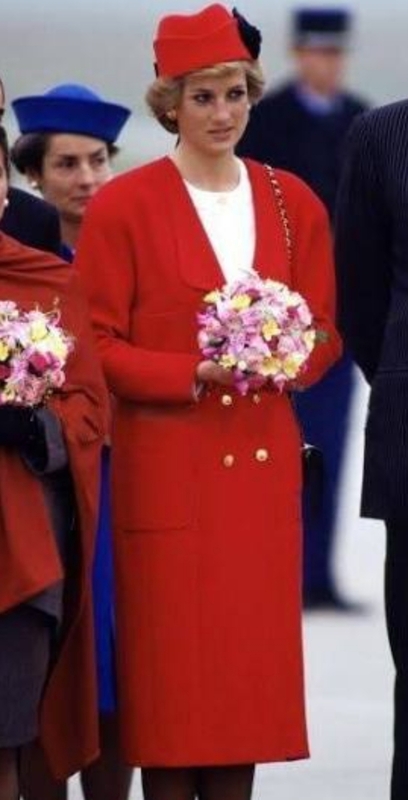 She was also striking, though looked a bit like an air hostess *mind you, a very stunning one :)* But I did like Princess Diana’s total look much better than Duchess’. Specifically because of the bag!! 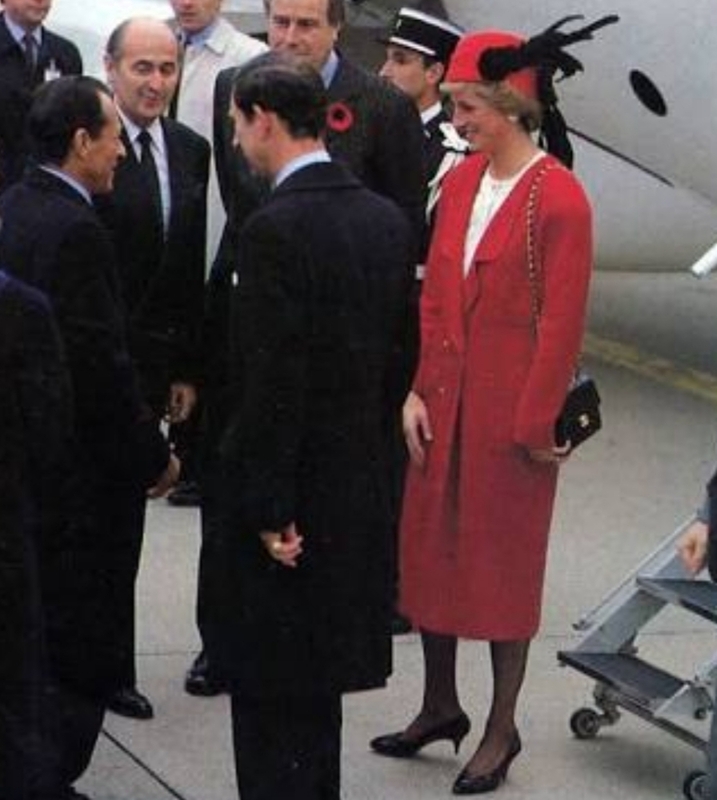 Princess Diana carried a classic flap Chanel– the exact style that remains au courant and in demand today. 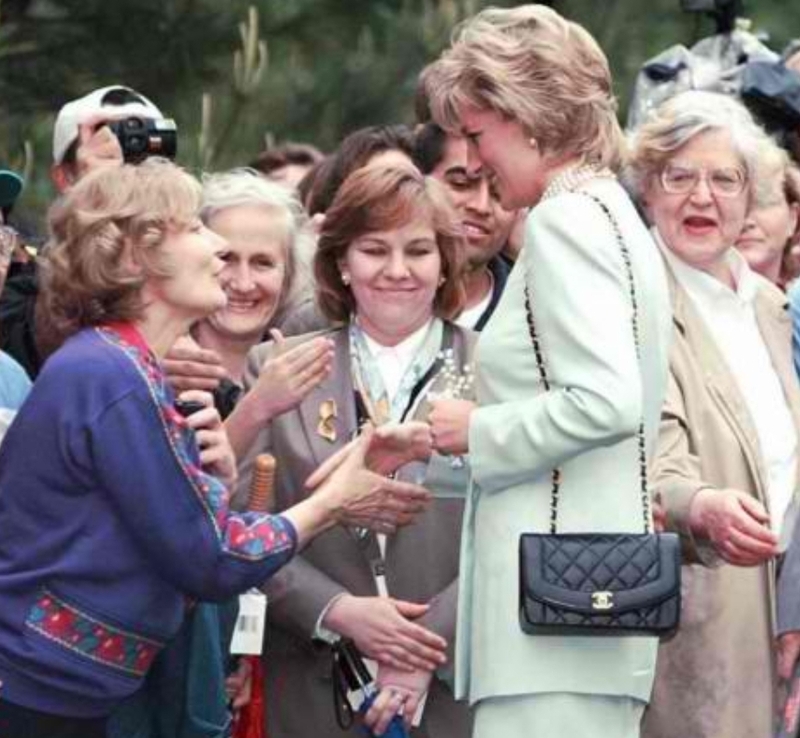 Diana was again seen carrying the classic flap Chanel bag in another of her public engagements decades ago. Comparisons between the 2 future monarch’s wives (one former and sadly deceased) are inevitable. And while their styles are both unique and classy, both of whom remain very admirable, I just can’t help but point out this particular bag choice. It could very well be presents from the hosting country, but I’m quite positive both women were made to choose which they preferred (this is of course, only an assumption, as their wardrobe may actually have been paid for by their own households rather than gifted by their host countries). I hope Catherine at some point in time, carries a better- looking Chanel bag! 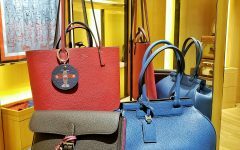 That or we will just have to wait for a similar opportunity with Duchess-in-Waiting, Meghan Markle, who by the way, has carried some pretty interesting bags!